Mambo: Metal base bathed in 24-carat gold Solid pinewood and fiber frame. Laminated board seat. Beechwood board backrest with high frequency curved. Wadding coating of 150 g/m^2 External and internal structure covered with hard foam of 20 kg Upholstery velvet 100% polyester with backing. 345 gr/m^2. 45000 Martindale cycles. Bottom part with fringe of 17cm Design by Masquespacio for Houtique. 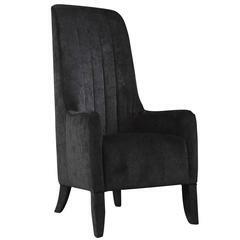 "Spin" is a Fifty style armchair with velvet piped seat and seatback. The legs intersect the armrests giving the seat a dynamic trait. 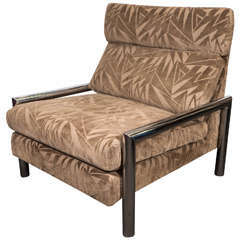 A vintage armchair with chrome body and newly reupholstered in taupe cut velvet. Pair of armchairs, metal structure, wooden arms, foam padding and velvet upholstery. Manufactured in France, 1950s-1960s.